Data shows from the American Institute of Architects that .02 percent of their professionals are women of color. 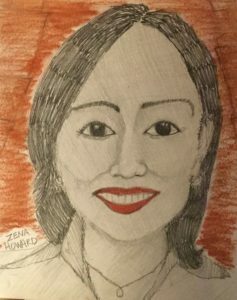 This makes Zena Howard an African American woman architect a very rare person indeed. She is well a documented rising star in the profession. During 2017, her title became principal and ‘managing director of the Durham and Charlotte offices’ of the International firm of Perkins + Will. Many articles from Perkins + Will promotes awareness of Zena’s career and successes as an architect. Zena is on LinkedIn, which shows her career jobs as project architect and eventually principal at The Freelon Group. Zena’s building projects include Anacostia Library, Human Resources Building in Durham, and smaller museums. Her tested capacity and experience made her most ideal to step into the managing director role after architect Phil Freelon, who remains the design director at Perkins + Will. Due to neuron effects of ALS (Amyotrophic lateral sclerosis) he had to relinquish day to day operations. Many people may not be unaware that Freelon, at age 65, is still in the prime of his career as an architect and was acknowledged as ‘Architect of the Year’ by the American Institute of Architects December 2017. This places Zena at ‘up and coming’. The ‘planned acquisition’ of the 60 member Freelon Group with Perkins + Will came amid work on the National Museum of African American History and Culture in Washington DC (which just won ‘Building of the Year’). The Freelon Group were the design Architects on that building in collaboration with lead designer, British-Ghanaian architect, David Adjaye; J Max Bond (of NYC Davis Brody Bond (deceased (2009) was my former professor at Columbia and Julian Bond’s cousin) also a design partner along with the addition of a large interdisciplinary architectural/engineering firm SmithGroup to round out the winning team. Zena Howard, as design project architect, worked on construction of significant portions of the building for over eight years of her professional life. Ensuring design details during construction, are what brings the building to its full potential. It’s the fine work that customers experience when visiting: quality of air, light, sight, sound, flow, surfaces and spaces as parts of a great building. Recall that .02 percentage of African American women are in the field of Architecture up from the 0.01 several decades ago. It is very difficult to express the uniqueness and fragile circumstances of women in architecture as a few manage to rise and shine. Zena Howard established a successful route with progressive experience in the profession and still at a young age for evolving architects. One could follow her career for many years to come. I was referred to her near the end of her working days on the National Museum of African American History and Culture. I actually ran into her at a genealogy event in Durham. Zena was gracious; her personality was vibrant and energetic. I could see and sense that she was at a high point in her career reflecting great confidence and mastery of her skills and talents. Once we had a chance to talk after completion of the Museum, Zena spoke about her efforts and desire to help inspire and develop young African American women architects, something that is sorely needed. She was helpful in referring me to possible relationships and opportunities to work with Perkins + Will. I am aware that she was successful in connecting others. She is part of an impressive group of local women architects who recognize that mentoring and assisting with the development of women in architecture is a worthy effort. She according to articles is sought after as a speaker. There are other impressive African American women architects from different locations around the country and sometimes heirs of their family businesses that deserve appreciation. Zena Howard did not even know what architecture was and discovered it from a TV show. Born in Texas, lived in Rocky Mount, NC and upstate New York she learned about racism and experienced being made fun of by her school mates. She learned from that which gave her perspective on the importance of architecture in bringing people together. Fortunately for us she landed in Durham, North Carolina. Zena graduated from the University of Virginia. She began her career elsewhere and now has spent a major part of her professional career with The Freelon Group (10 years) and now through a planned acquisition is principal with the international renown firm of Perkins + Will. Zena represents what so many women aspire to accomplish in the field of architecture and knowing that she is doing it with grace and dignity makes it most impressive. By working on the National Museum of African American History and Culture she has begun establishing a worthy legacy in the local, regional, national and international markets of which we all can be proud.